WASHINGTON — A spacesuit sizing issue has prompted NASA to reshuffle assignments for a pair of upcoming spacewalks at the International Space Station, cancelling a first-ever all-woman spacewalk and in the process turning what had been an accidental public relations coup for the agency into a headache. NASA announced March 25 that Anne McClain, who performed a spacewalk with fellow NASA astronaut Nick Hague March 22, won’t participate in another spacewalk scheduled for March 29 with Christina Koch. Hague will instead perform the spacewalk with Koch to replace batteries that are part of the station’s power system. The agency said it made the change after McClain found that she would be more comfortable wearing a suit with a medium-sized hard upper torso segment, rather than the large size she wore on the earlier spacewalk. Only one suit with a medium-sized torso is ready for use on the station, and station managers decided to have Koch use that suit. There were no signs in the earlier spacewalk by McClain that the larger suit was a problem. An agency spokesperson said March 25 that McClain trained for the spacewalks on the ground in using medium and large torso segments, and initially thought that the larger suit would work, but concluded after the March 22 spacewalk that the smaller suit would be more comfortable. Even with extensive training on the ground, getting the right fit for a spacesuit in microgravity can be a challenge. “When they launch on board, we know pretty well what suit size they are but, of course, your body changes slightly in space due to fluid shifts or spine elongation,” said Mary Lawrence, a NASA spacewalk flight director, during a March 19 press conference about the spacewalks. A relatively routine reshuffling of crew assignments generated extra attention, and scrutiny, because of the historical significance of the planned spacewalk. Had the previous schedule held, a Koch-McClain spacewalk would have been the first in the history of spaceflight featuring only women. Agency officials, though, emphasized they did not deliberately team up Koch and McClain for that milestone. “There were a lot of circumstances that got us here,” said Kenny Todd, manager for ISS operations and integration at NASA, during the same briefing. Among those factors were delays in the spacewalk caused by changes in crew assignments and schedules after the aborted Soyuz MS-10 launch last October. Todd said that the historical significance didn’t immediately dawn on him or others planning the spacewalk. “It just wasn’t something that jumped out at us,” he said. While NASA didn’t deliberately plan an all-woman spacewalk, it enjoyed the extra attention paid to it. That attention, though, created a backlash in social media when NASA announced the reassignment, with some people accusing the agency of sexism for not having enough medium-sized suits on the station or not being willing to delay the spacewalk until a solution could be found to allow Koch and McClain to perform an EVA together. NASA later noted that there is a second medium-sized spacesuit torso on the station, but it is not currently configured for a spacewalk. An agency spokesperson said it’s easier to change the spacewalk crew assignments and keep to the current schedule than to reconfigure the spacesuits and delay the EVAs. Delaying the spacewalk would pose other schedule challenges as well. Todd noted at the earlier briefing that April will be a busy month at the station with three cargo vehicles slated to arrive there. A Russian Progress cargo spacecraft is scheduled to launch to the station April 4, followed by a Northrop Grumman Cygnus spacecraft April 17. A SpaceX Dragon cargo spacecraft will follow in late April. McClain, while not participating in this EVA, will take part in another spacewalk. 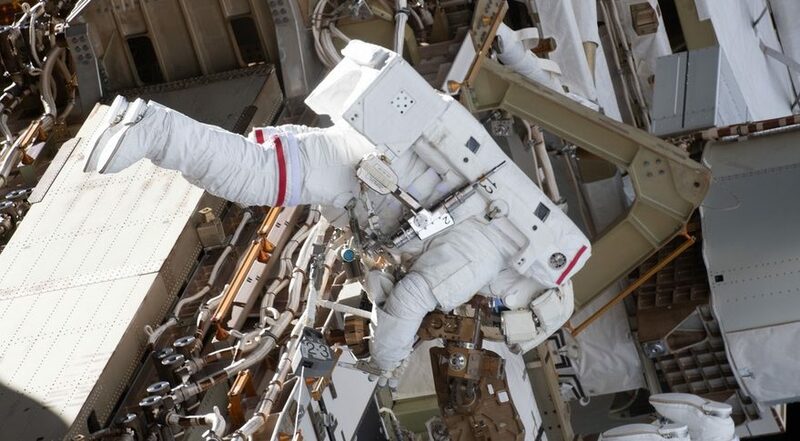 NASA announced March 25 that she and Canadian astronaut David Saint-Jacques will perform the third and last in the current series of spacewalks on April 8.